My fellow blogger over at the Pro Photo Business blog brought to my attention this, in his entry - The Generational Divide in Copyright Morality, where he, in turn, refers to an article by David Pogue, of the same title, which can be found here. "I've said it publicly plenty of times: the face of copyright is changing, and as as visual artists, we should be well aware of how it could effect us. Blindly sticking a stake in the ground for copyright is like re-arranging the deck chairs on the Titanic." The Pogue article noted that out of 500 people in attendance at his talk, only two thought that downloading music and movies for free off the internet "might be wrong." Until the laws change, however, while more and more people are going to be infringing on your work, (note: there are two types of creatives in this world - those that have had their creative works infringed, and those that will) there will be more and more opportunities for you to reap the punitive benefits from these thieves. Yes, that means registering your work, and yes, that means pursing them with an attorney. Don't get me wrong, I'm not happy about this, because I'd rather be making pictures. But the fact remains, that when people steal your creative endeavors, you should be vigilant about going after them. On the other hand, perhaps if you do produce work, and are paid for it, and wish to distribute it after the fact to others for their own private use, then denoting the work - at the least - with a Creative Commons designator stating what you do - and do not - want done with your work, will be one way in which you can share your endeavors, but ensure that it's not used by corporate America without their paying, yet still being available to the every man. Creative Commons defines the spectrum of possibilities between full copyright — all rights reserved — and the public domain — no rights reserved. Our licenses help you keep your copyright while inviting certain uses of your work — a “some rights reserved” copyright. Too often the debate over creative control tends to the extremes. At one pole is a vision of total control — a world in which every last use of a work is regulated and in which “all rights reserved” (and then some) is the norm. At the other end is a vision of anarchy — a world in which creators enjoy a wide range of freedom but are left vulnerable to exploitation. Balance, compromise, and moderation — once the driving forces of a copyright system that valued innovation and protection equally — have become endangered species. As it stands, the law is, as above "... a world in which every last use of a work is regulated and in which “all rights reserved” (and then some) is the norm...", and I like that that is the default. Yet, I know of people who don't want to do this, and Creative Commons is their way to designate that. So, pick your level of comfort, and be sure to designate that as such. Just because "the kids" think it's ok to steal your work, doesn't make it so. When the laws of copyright meet up with the patent laws that only protect pharmaceuticals for about 20 years (more here on that), then it will be a new world order for copyright, and people will, in order for creatives to continue to survive, cost so much more on the front end to commission the work, because of the shortened life-span of copyright. That may end up being an unintended consequence of a change in copyright. Who knows. One of my daily reads is Mr. Unknown over at A Photo Editor. I am just making a leap in assuming it's a he, so, go with me on this. I've been seeing an interesting trend in his entries - many of them are tagged "photography business". Which is good. The latest is about the corporate greed that is driving downwards the availability of talent, by way of the photographers' ability to cover their costs of being in business. Earlier this week, I made an editorial portrait, and I do so again tomorrow, and it's a mix of what I do. I've been saying for some time, and often I feel as if I'm on a soap box without a line to step up when I step down, about how it's the bean counters to blame for what's happening, and how there will be a loss of talent because of it, and now, we're seeing evidence of that as APE is reporting on this greed. My friend and colleague Michael Stewart also recently started a blog - http://foto-tech.com/, and his latest article discusses something called HDR - or, High-Dynamic Range images. He's got an interesting example of a pool and home, and he shows you the images that were used to composite together to make what is otherwise a near impossible image to produce in a single shot. It used to be that it would take thousands of dollars in lighting equipment to make an image like that happen, but it can now be done with available light and a firm tripod, and little else. These points illustrate that you shouldn't be basing what you do on price, or technical skills. Instead, it should be on vision, and customer service. Is there any difference, really, between this single white t-shirt at Nordstroms for $18, and this pack of 3 fruit-of-the-loom t-shirts at K-Mart for $9.49? Probably not much. But, the service - is it worth it? Nordstrom's has proven that the answer is yes, and photographers who choose to compete on points other than price or rights-give-aways have shown that it works in our field too. Today we were on a shoot that called for catering. No, it wasn't the client that called for it, they weren't actually on set this time, it was the reality of the circumstances. We had a three assistant crew, two makeup people, two subjects, and four handlers, oh, and me. I get hungry, and anyone who knows me, knows that a sandwich and a Diet Coke will make me much less grumpy. So too, clients and subjects. But what food, and why should I cater it anyway? When you're called to shoot something, even if it doesn't span a mealtime, bringing along food is critical. It's true - An army marches on it's stomach. So too, do assistants, and the rest of those on site. In fact, I've known more than one client complain about working with other photographers who either were upset because catering wasn't on the estimate, or got to a shoot, and it wasn't there, already laid out. When we arrived today, before the gear came in, before the cameras were in place, the second assistant was detailed to set up the catering. I didn't want anyone arriving on set and not seeing food and beverage. Above is the bill (click to see it larger) for catering, minus the drinks, which we brought in a separate cooler - water, vitamin water, and Diet Coke. On a humorous note, our subjects, half-way through the shoot said "hey, where's the tequila? ", to which I responded, without loosing stride "I didn't see that on the rider..." and kept shooting. (they laughed). But don't even think of catering it yourself, or using Subway or Quizno's. 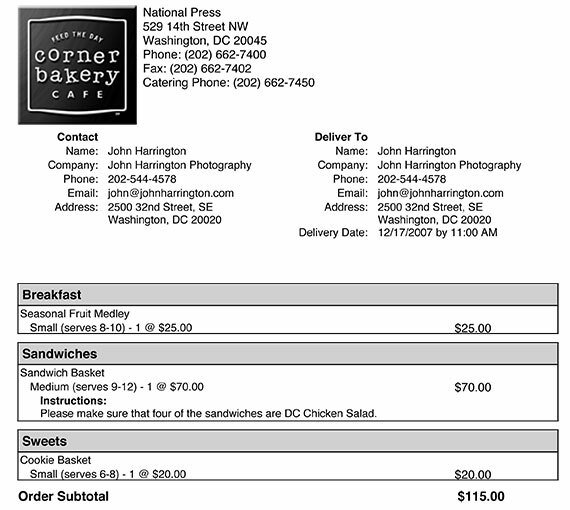 Places which make gourmet sandwiches, cookies, and so forth, are a good solution, we like Corner Bakery here in DC. Be sure to know if anyone who will be partaking has food allergies or restrictions. A wide variety of the riders in the link above outline all sorts of restrictions, from "no pork", to brands of water and so forth. If it's a huge shoot, you may be best served to call in a caterer that has servers, but I'm not going there with this. When the subjects walked in, they reacted by saying "wow, look at this, I didn't expect this!" And then I introduced her to the makeup and hair stylists, while her handlers grabbed waters and cookies, and headed off to quieter parts of the set with their blackberries in hand, satiated. During a wardrobe change, the subjects opted to grab a bite, which ensured that they weren't feeling the pangs of hunger that would become moodiness that would result in lesser expressions, and an eagerness to depart. No one felt a need to order in, and when we were done, there were three cookies and four sandwich halves left. There were no Diet Cokes left (my fault, I drank most of them), and a few vitamin waters. All in all, just right. The frequent refrain from clients I hear when I ask (as a part of our conversation about my producing work that will run as an advertisement or for corporate/commercial uses) about what the photograph will be used for and to what extent is "...oh, we're not sure where we'll use it yet....", which is double-speak for "we want to get the lowest price from you, and if you really knew how much we'd be using your photographs you'd want to charge us more, so we're not going to tell you everything..."
That's not to say that there aren't clients who aren't straight with you up front - there are, but there are many who are not. But, it's worth backing up here for a minute, for those of you who don't get "usage". Simply put - if someone wants to use your photograph once (whether you create it specific to their needs, or as pre-existing stock), and it will be in a weekly newspaper serving your community, the benefit the client will receive (and the exposure of your image), will be "X". If the client wants to use it 10 times, then, for that client, the benefit (and thus, the exposure of your image) is 10x. When it then appears on billboards, or in the local daily paper, and on brochures, and so forth, the benefit multiplies again and again. As the client benefits from your work, you are entitled to an increased generation of revenue. It's only fair. Every time an ad agency or PR firm proposes an ad campaign to their client, they give a pitch, putting forth a detailed proposal about the metrics and benefits of the placement. How much it will cost, why certain viewers/readers/public locales/eyeballs are better than others, and how to produce the work. The following estimates are provided for the various components based upon the media plan options presented today for XXXX XXXXXXXXX. All pieces will be based upon the XYZABCD concept, and will be customized as necessary for the specific media that was selected. Photography that is unique to NYC and it's environs, and reaches both the parents and children is an essential part of this campaign concept. We have looked into a stock photography solution, and were unable to find appropriate shots and highly recommend producing original photography, that can be used for print, collateral, outdoor and web in the New York region. We recommend a full-day shoot, in one New York City location. This will allow time for shooting photography for both the "parents centric" and the "children centric" ads in the same day, which is the most cost-effective approach. The budget for this shoot, including all photographer's fees, location scout, permit fees, stylist, and photographers rights package is $12,000-$14,000. The estimate for professional services to review and select an appropriate photographer, coordinate shoot logistics, recruit and retain appropriate talent, attend and art direct the photo shoot, and review and select final photography is $5,500 - $7,500. Talent fees for two ads, including a full buyout for the distribution outlined are estimated at $4,500-$6,500, which may include up to four talent. The estimate for production of two print ads ("parent centric" and "children centric"), including copyrighting, art direction, headline illustration, coordination and management of photo shoot, art production and overall project management is $18,000 - $21,000. 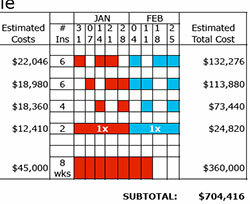 The estimate for creative development of an animated banner ad campaign is $5,500 - $6,500. This estimate includes adapting the creative concept for web use, art direction, copyrighting, and execution of Flash banner ads with static .gif backups. This provides one banner for each "parents centric" and "children centric" execution. So, when you're contacted by a prospective client for a campaign, recognize that many things are already determined. They will often have already proposed a budget to the end client, however, more often than not, I have been called for a quote for an assignment and been told that what I provide will be for their pitch. Often, this is the case when you are the preferred photographer, that will likely win the assignment if the client wins it. During the conversation, ask the person calling for the campaign's "media schedule" so you can determine proper usage. Ask for them to e-mail you the PDF, or fax it to you. As above, click here to see what it looked like for this pitch. If they say they don't have one yet, you can say that your estimate will be higher than it might otherwise be without it, and then ask what the usage will be - number of insertions, circulation, size, and so forth. 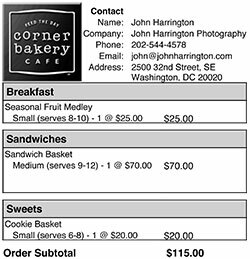 Your creative and usage/licensing fees will be either combined, or separate (see the points on this debate here), and once the client has outlined their usage, using photography business software like fotoQuote (details about them here), and be sure to use the PLUS language to outline the rights package (as detailed here). By the time a client calls a photographer, more often than not, many of the details are worked out, the pitch and campaign approved in concept, and dollars allocated. Be sure to ask the right questions during your client dialog so everyone is working from the same page when you prepare your estimate. Ask for comps/layouts so you know what you're going to be expected to produce. These things are true whether they're for a major campaign, or a one-time small-town paper campaign. They're true when they're for a brochure, an annual report, point-of-purchase poster, billboard, web page ad, and so forth. * note: To protect the source, slight changes have been made to the media schedule and estimate proposal, but the content, look, feel, layout, and all language except identifying names/campaigns, and actual dollars involved are as presented. These dollar figures are comparable to those presented.